The Porcelain Pistols, a four-piece band based in Southern California, formed in October 2010. Utilizing each member’s vast experience with various musical instruments and music styles, they combine Rock, Alternative and Punk into the music they create. Consisting of Chuy Sandoval (Guitar/Backing Vocals), Rich Lopez (Drums), Jaime Molinar (Bass) and eVee Musgrave (Vocals/Keyboard), the band quickly began writing music creating their own unique identity using influences from Chevelle, Queens of the Stone Age, Stone Temple Pilots, Nirvana, Foo Fighters, and Guano Apes. Dedicated, talented and driven, the band knew they had something special from the beginning. 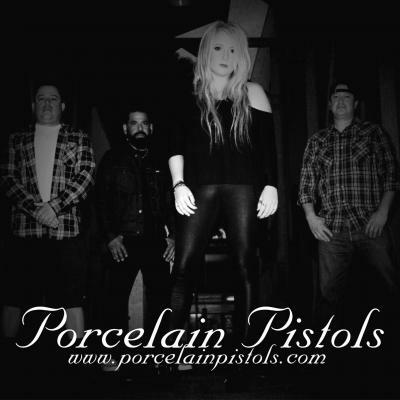 In 2011, the Porcelain Pistols hit the local music scene to hone their craft on the stage. With each and every show, the music, the performance, the energy…got tighter, stronger and more intense. That same year they released their first EP with positive results, landing them bigger venues like the House Of Blues in Anaheim with A Static Lullaby, The Playground Festival in Irvine with Fishbone and The Yost Theater in Santa Ana supporting slot for Sevendust. Since then, the band went on an acoustic rendezvous from 2012-2013 performing throughout LA & Orange counties. Missing the electric feel and plenty of written ideas the Porcelain Pistols went back to the studio to work on and record their upcoming first full length LP to be released on I-Tunes December 2014. Porcelain Pistols hope to be pushing their dynamic music and creative talent to a whole new level at the same time expanding their fan base.